A picture says a thousand words and that’s all it took to completely change the idea of my graduation project. For the first semester of my college program, I was convinced I wanted to do a documentary on something related to the Filipino community. During my winter break before I had to present my project concept I bought a photography magazine. There were pages upon pages of beautiful work, but nothing struck me to the core more than a photograph of a burn survivor. When I was nine months old I pulled a pot of boiling water on myself, resulting in second and third degree burns on 40-60 per cent of my body. Most of them are easily hidden with clothes. During that time, my family was living in a rural community in the Philippines and we had to wait until the next day to have any transportation to a hospital that could properly treat my burns. Since the accident was 25 years ago, and because my parents found it difficult to talk about it, I only know bits and pieces of my recovery. I later learned that I was in the hospital for several weeks. Along with being treated for my burns, I also had to have three blood transfusions which all failed except the final attempt. Following my release, I needed special bandages on my burns for a couple weeks that my mom regularly changed. Growing up I also had check ups on my scars. 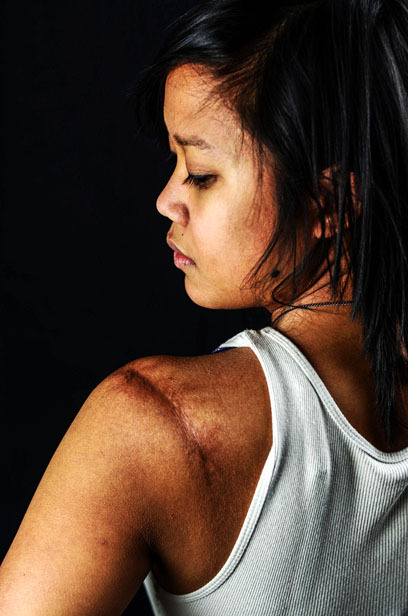 Although some burn survivors require additional surgeries after their accident, my burns stretched well with my skin as I grew and I never had to go for any additional surgeries. More pictures of my scars, which include those on my chest. When I was growing up it was questionable whether I would even develop properly because I was burned on my chest. I have more scars then what is shown in these pictures. Until my late teens, I didn’t let anyone outside my immediate family know about my accident and burns. I did this because at an early age I would hear people talk about burn survivors in a negative aspect and I didn’t want to be bullied. However, in doing so I went through living as a burn survivor on my own, which at times was very painful and lonely. Hiding how I felt for so many years definitely affected me psychologically and caused me to have low self-esteem about my body image. Simple things like public change rooms terrified me. And because I didn’t want anyone to know about my accident I would always cover up my body parts that had scars. This included never wearing anything that would expose my bare shoulders or anything even slightly low cut. I also had difficulty developing close relationships with others because I was scared about what they would think about me afterwards if they knew that I was a burn survivor. I kept most of my feelings to myself, but sometimes I would talk to my family about my insecurities as a burn survivor and they were very supportive. These constant reinforcements helped me with these issue and I also eventually learned to open up to people outside of my family about being a burn survivor. After years of struggling with the emotional issues of being a burn survivor, I thought I had gotten over them. However, after seeing the photograph of the burn survivor I couldn’t stop thinking about it. Finally, after keeping all of my thoughts to myself, I talked to a good friend about it and what she said changed my life. She told me about an organization called the Canadian Burn Survivors Community that held regular conferences. I did some research on the organization and was introduced to resources I never knew existed, and the more I found out, the more I wanted to know. In particular, I wanted to know about other burn survivors. However, there wasn’t anything in-depth about anyone’s stories. And so I decided that if there wasn’t anything available yet, I was going to make it happen. But that was no simple task. I had never met another burn survivor before and I wasn’t really sure where to start. It seemed like fate was in my hands though, because one of the organization’s co-chairs, Barbara-Anne Hodge, lived in the same city as me. After presenting my project to the board of the Canadian Burn Survivors Community, and getting approved by my school to do my project, that’s when it all started coming together. I also joined my local burn support group and met burn survivors for the first time and learned about their experiences. The 2012 Canadian Burn Survivors Conference that summer also gave me an amazing opportunity to interview and photograph other burn survivors from across the country. Through the generous support of the Mamingwey Burn Survivors Group, people from my local burn support group were given some financial assistance to attend the conference in Calgary. During that time, I met with six out of the ten participants in my project. With interviews set up while I was there, and with all my previous training in communications, I thought I was ready. But I didn’t expect the emotional toil this project took on me. As I interviewed each burn survivor, bits and pieces of each story reminded me of my own experiences, including memories I wanted to forget. It made me question whether I was really prepared to put myself in the public eye as a burn survivor. I was so distraught that after every interview, I would go into my room and burst into tears. But it was the support of the burn support community, and the other people in my support system, that pushed me to continue on with my project. Most of all, it was because I never wanted anyone to go through what I did alone. Three conferences later, conducting photographs and interview sessions for months, and learning to create a website, After the Cocoon was born and will hopefully continue on for years. Laureano lives in Winnipeg, MB and will be graduating from the Creative Communications program at Red River College in spring 2013. Laureano is also an award-winning blogger and a freelance writer and photographer. Hi Maria! I heard your interview on CBC and I had to check out your project…it’s fantastic! You should be very proud of what you’ve created! I’m so impressed. So many will benefit from what you’ve done and for that I thank you. All the best from a fellow Winnipeger.